How to reflect on depth without acknowledging that one stands on the surface. The one who stands will continue calling it depth. The one who immerses will have to create another name. Far out at the edge, depth loosely hangs. Åpning fredag 17. januar kl. 20-22. Åpent lørdag 18. og søndag 19. kl. 12-18. Left: Julia Lee Hong, A thorn that is pink and round, 2013-2014. Middle: Jenny Patiño Pérez, Commonplace, 2014. 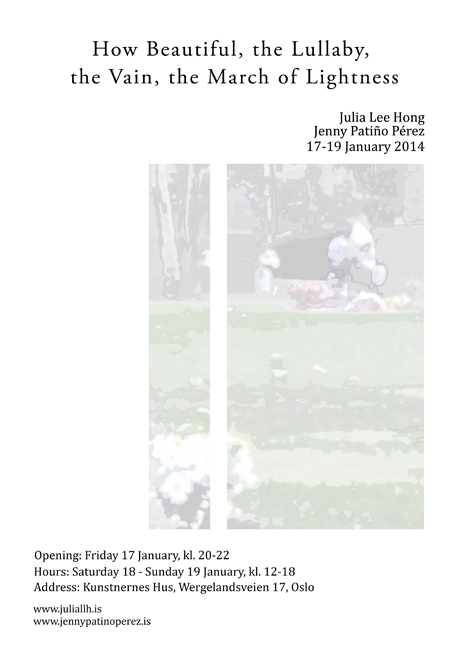 Right: Julia Lee Hong, Neck Arrangement, 2014.